Do you already have riding experience but are looking to improve? Or, perhaps, you haven’t ridden for a while? If so, then this is the holiday for you! This "Improve Your Riding" package offers you a perfect mixture of lessons, beach rides, and a full-day trail, ensuring you maximum enjoyment during your holiday. All you need is your previous experience to canter, then you are good to go! The accommodation for your two nights' stay will be at a local bed and breakfast, provided off-site by approved local bed and breakfast providers. 13:30 Arrive at the stables. 14:00 Assessment lesson followed by beach / dune ride (until 16:00). 11:00 Riding Lesson or beach ride (until 12:00). 14:00 Beach / dune ride (until 16:00). 10:00 All day beach trail with lunch included (until 16:00). Depending on your experience and tide conditions, the ride may start off-site and you will ride either the Mullaghmore Trail or Rossnowlagh Trail. Please note that all lessons are graded to your ability and will work towards any goals you have e.g. learning to jump. Beach rides can be substituted for riding lessons if you prefer to ride out of the arena. All Donegal Equestrian Centre horses are ridden English style with English saddles and bridles. If you have only Western-type saddle experience, you will be considered a beginner / novice rider unless you have taken English-seat riding lessons. For any advanced beach rides, riders need to be familiar with English saddles and be able to rise (post) to the trot and canter. Donegal Equestrian Centre upper weight limit is 230 pounds, 16 and a half stone, or 105 kilograms. For safety and horse welfare reasons, Donegal Equestrian Centre is unable to accept riders over this weight. 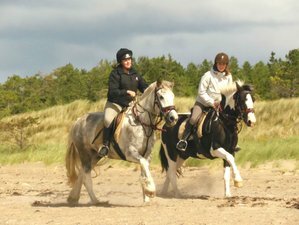 Donegal Equestrian Centre is situated one mile from the centre of Bundoran in the beautiful northwest coast of Ireland, which is the perfect location for all your horse riding activities. Please book your flight to arrive at Ireland West Knock Airport (NOC). Ireland West Knock Airport (NOC) is the nearest airport from Bundoran. Alternatively, you can book a flight to Dublin Airport (DUB). From Dublin Airport (DUB): Bus Eireann run the Expressway route X30 to and from Dublin Airport (DUB) every two hours. The nearest stop to Donegal Equestrian Centre is Ballyshannon. From Ireland West Knock Airport (NOC): Bus Eireann route 64 runs from Ireland West Knock Airport (NOC) to Bundoran. The journey takes approximately two hours. From Donegal Town: Bus Eireann local route 480 runs from Donegal Town to Bundoran. The nearest stop to the stables is Finner. The Expressway X30 also runs from Donegal to Bundoran. Local taxi companies operating from Bundoran are OK Cabs and Roadrunner Cabs. Donegal Equestrian Centre providers of high quality horse riding experiences for all ages and abilities. This holiday is available all year round with arrival on Tuesday and Friday. Select an arrival date below. Please send inquery at least 14 days before arrival.